A versatile and playful pouch, designed in France and made with organic cotton. Featuring an illustrated West African giraffe on the front and a red pattern fabric. This cotton pouch was created to help raise environmental awareness and support sustainable practices. 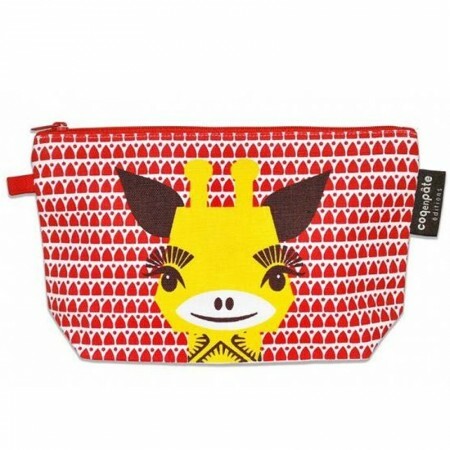 Ideal for a travel pouch, accessory organiser or kid's pencil case! Since its creation in 2007, the French children’s fashion and accessory brand Coq en Pâte has placed socially and environmental ethics in the heart of all creative processes. Their practices respect suppliers, support NGO's and support environmental education. All products are made from sustainable fabrics; all clothing is made from 100% certified organic cotton in India, while stationery and outdoor games are made in France from eco-friendly or recycled materials. GOTS Certified Organic Cotton is produced without the use of toxic pesticides that are harmful to you and the planet. Coq en Pâte support NGOs, scientists and associations devoted to wildlife conservation, in France and abroad. The company finances programs aimed at educating and engaging children in wildlife conservation. Red colour pattern on fabric. West African Giraffe print on front, highlighting this vulnerable species. Flat base with boxed corners. Use as a pencil case, travel pouch or organiser. PVC and phthalate free screen printing. Helps support NGO's in their efforts for wildlife conservation. Certified organic cotton. Plastic zipper teeth, YKK zip. When an item has reached the end of it’s life and can no longer be used, mended, swapped, gifted, donated or upcycled, we recommend consulting your local council to find your nearest textile recycling scheme. Browse our other bags here.